Doll House: MSH - Assemble the base, Drg 04-101, 04-104. MSH - Assemble the base, Drg 04-101, 04-104. Bring together the ground floor, Drg 04-104, piece and a piece of the 2x1 inch planed 35-5/8 inch. 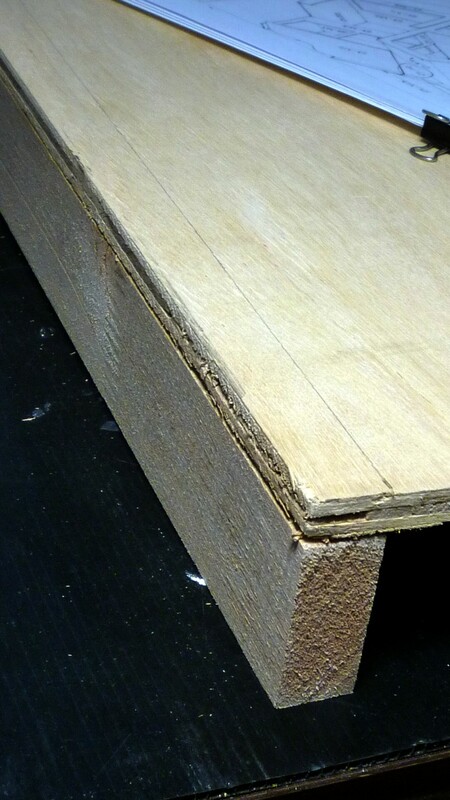 2x1 planed is always less that 2inch x 1 inch. The 2x1 refers to the size of the un-planed wood. Makes for a little complication in assembling the house but is easily compensated for. 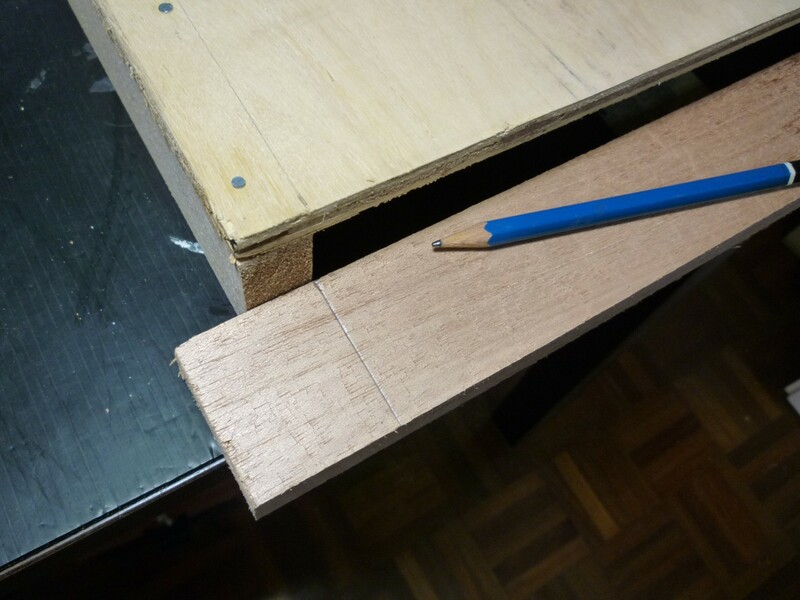 Draw a pencil line the thickness of the 2x1 along the long sides of the 04-004 ply. 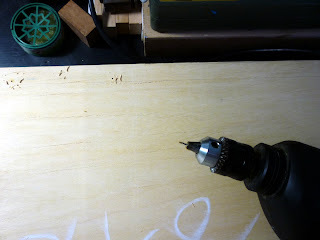 Using 1mm diameter drill, drill a series of holes in the ply between the pencil line and the ply's edge, down both sides of the ply. Place the holes roughly 50 to 100 mm apart and stagger they as shown in the picture above. 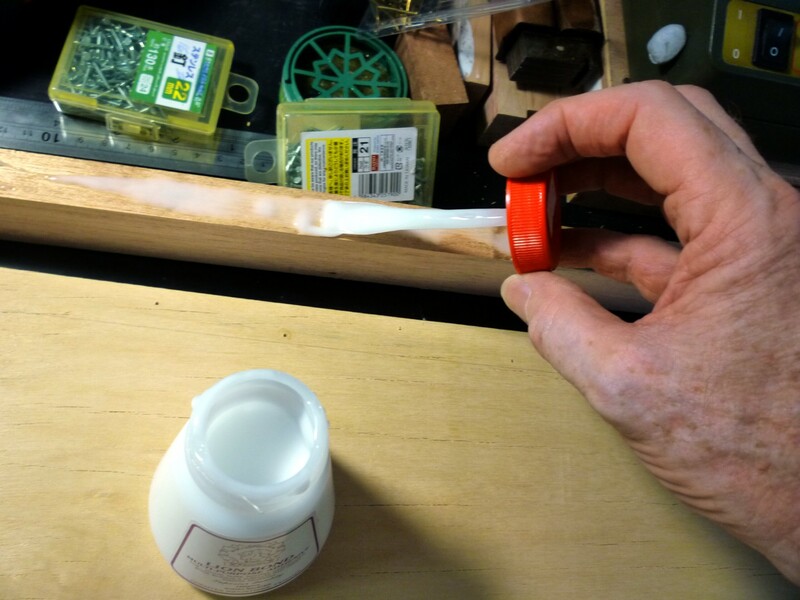 Cover the mating edge of the 2x1 with acrylic wood glue. This is also know as white glue. 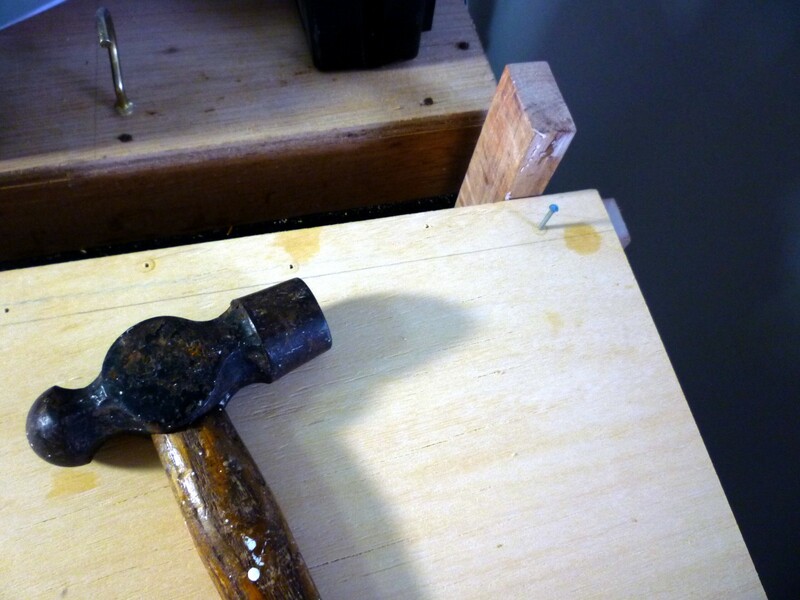 Using a square or ,as here, a 2x1 off cut, position the ground floor ply on top of the glued 2x1. This is a fairly critical point in the assembly and needs to be fairly accurately done, otherwise the side walls of the model will not be square to the base. 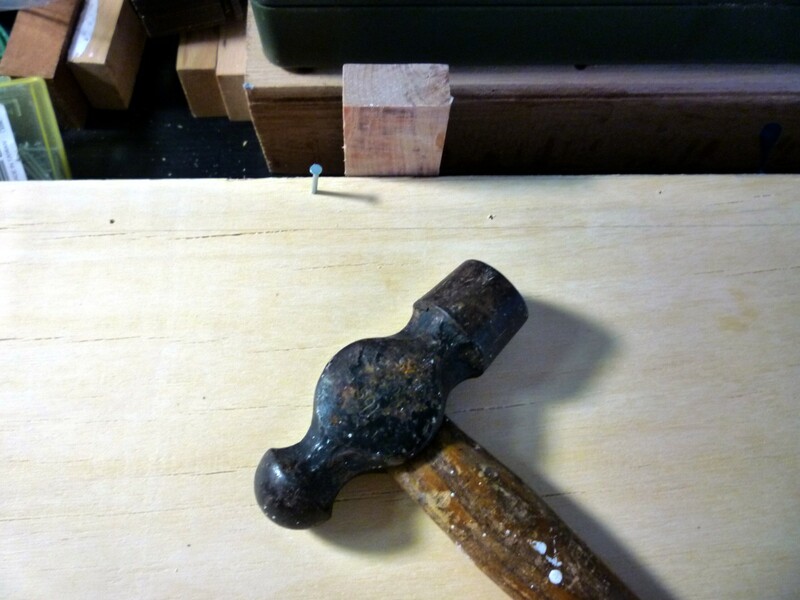 Place a nail in the first hole of the ply and hammer half way into the 2x1 just to locate this end of the joint. Do not nail home yet. Move to the other end of the joint and repeat the step above. Move to the centre of the joint and repeat the steps above. Once you are happy then the ply's edge and the 2x1 are aligned, nail home the three 'tacking' nails and complete the joint fixing by nailing through the rest of the drilled holes. This process to be repeated on both sides of the ground floor ply. The cutting list called for three pieces of 2x1, 15 inches long. To allow for the variation in 2x1 actual dimensions, these pieces need to be trimmed to fit as three cross braces for the base as shown in Drg 04-101. 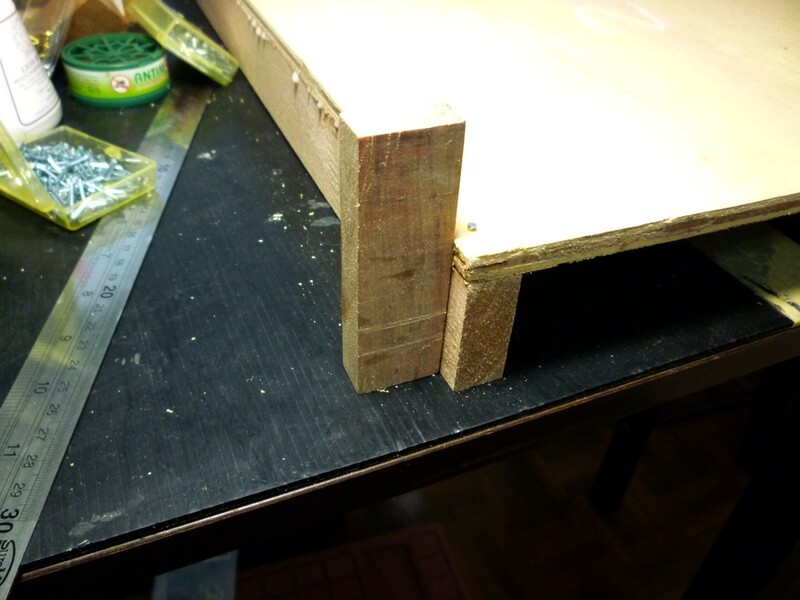 Place a 15 inch piece of 2x1 between the inside edges of the base and mark the length required as shown above. Use the square to indicate the cutting line. Saw the piece to length along the cutting line. Repeat the process used to fix the base sides to secure the cross brace to the ply. Repeat for the other two cross braces as shown in Drg 04-101.